If every teenager were as together as author Penn, the world would be a much different place. Maya started her first business at the age of 8, and she hasn't looked back. Now 15, she has started a nonprofit organization, been featured in dozens of articles and interviews, and given three TED talks. In the African-American teen’s first inspirational self-help book, she attempts to share some of her process with her readers. She explains the value of a dream board, the importance of finding out what kind of creative person you are, and she directs her readers to find friends and mentors that provide encouragement. 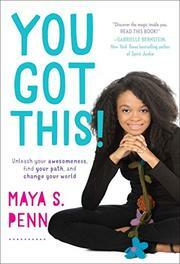 Maya offers plenty of good advice and peppers her narrative with her own stories of success and the challenges she overcame. However, she seems to be able to blink away some of the challenges she faced a little too easily, as when she recalls being taunted about her natural hair: “I felt a self-consciousness about my hair that had never been there before. (Luckily I was able to get over that. )” Had she explored these rough times more thoroughly, her book would have been even more useful to those readers for whom confidence and friends don't come easily.